The Kitchen Is My Dance Floor: Pioneer Woman Cinnamon Rolls - I finally made them! Pioneer Woman Cinnamon Rolls - I finally made them! Do you love Pioneer Woman as much as I do? I love reading Ree's daily posts. She seems like such a sweet person. I really love finding new recipes on her site. We eat Chicken Spaghetti at least 3 times a month! Seriously. That stuff is good. I've tried several recipes out of her cookbook and they were all amazing. I now have a whole new way of making pot roast that it way better then the way I use to do it. I'm in love with her chicken fried steak and we love love love those cinnamon and sugar muffin things. I gave some to the neighbor last time I made them...I thought she was going to kiss me she was so happy to get them. 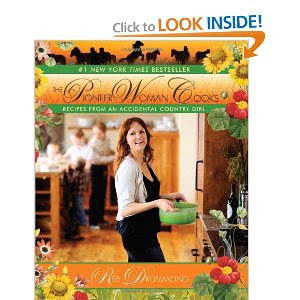 But, in all this time that I've owned Ree's cookbook The Pioneer Woman Cooks , the cinnamon rolls have always scared me. I've never really tried to make homemade, from scratch bread. I make bread from the bread machine all the time. But never from scratch. I've spend the last couple of years pouring over that cookbook over and over again and always looking at the recipe for the cinnamon rolls but never having the balls to really make them. The doubts would roll through my head. It'll take hours to make those. When will I find that kind of time? What if I screw it all up? I'll have wasted all that time and energy? Who will I serve 40+ cinnamon rolls to? I can't make bread! Are you crazy! All these doubts would roll through my head. Until last weekend. I decided to bite the bullet and just do it. You need a ton of milk and flour to make those, so I went to the store and bought what I needed. I figured if I had everything I would need, there would be no excuse to NOT make them. I told my husband my intentions. He didn't have the doubts I did. He was just excited to have some fresh baked cinnamon rolls. I mixed and waited and rolled and waited. I melted butter and floured and measured. When all was said and done. It had really only taken me a little over an hour (other then the hour of rising - but I don't count that since I left for a bit during this stage). But I did it. The table was covered in flour and butter and sugar and cinnamon. The kitchen was a wreck. But I did it. I was so proud. Really. I was beaming. I put the first batch in the oven. My oldest son kept running upstairs asking if they were done yet. I was getting nervous. What if they are gross? I probably added too much sugar or not enough cinnamon. Oh no. The first batch came out, I poured the frosting and cut the first bites for everyone. They were heavenly. Pure heaven. I had tamed the beast. I ended up taking a batch to the neighbors and a pan to our church group. Everyone raved. Everyone told me how brave I was to go after the Pioneer Women cinnamon rolls. Apparently I wasn't the only one who was scared. I'm glade I pushed myself. I need to learn to trust my skills more then I do. I'm sure I have some other beasts that need to be tamed. What are some beasts that you need to tame? What's holding you back? I love so many of her recipes. She is amazing. I wish I could eat her food every day. I love the PW recipes!